As requested by ELTF, Chennai Central MP Shri S R Vijayakumar took up the issue of poor management of 'interest subsidy scheme' by the banks in the Lok Sabha under Rule No 377 on 30th July 2014. link. In response to the submission in Lok Sabha, Hon'ble Finance Minister Shri Arun Jaitley has sent his personal response to Shri S R Vijayakumar MP on 1st Dec 2014. In this letter, Finance Minister mentions the following important points. 1. All Banks have been asked to display in their branch premises prominently, a toll free number for giving complaints. 2. All Banks have been advised to follow the instructions given by the Government/RBI and IBA for considering and granting of education loans. 3. All banks have been advised not to insist the student borrowers to pay interest during the moratorium period, if they are eligible for interest subsidy. 4. Interest subsidy scheme has been duly publicised through print and TV media widely. 5. 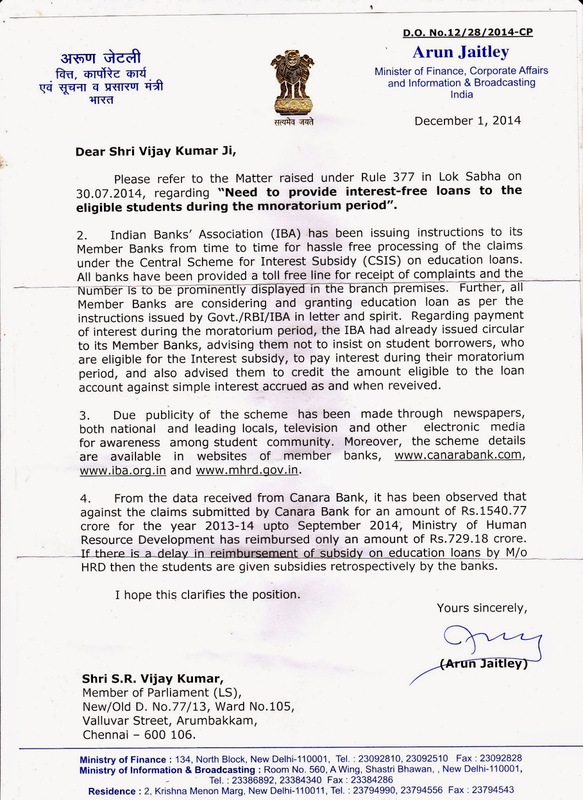 If there is a delay in reimbursement of subsidy, the students are given retrospectively by the banks. Probably, ELTF feels that Hon'ble Finance Minister might have just reproduced the comment given by IBA or any other authorities, as if the entire system is working well. In reality, the banks are not displaying any toll free number prominently to enable the public to communicate the grievances. Banks do not follow the guidelines issued by IBA in respect of Education Loans. Many of the Private Banks have scant respect for IBA guidelines. Though, the banks have been instructed not to insist on the payment of interest, if they are eligible for interest subsidy, during moratorium period. In reality, all the banks force the banks to pay interest during the moratorium period. Instead of calculating at simple rate, all the banks calculate interest on compounded basis. Though the students are eligible for 100% interest subsidy, they are given only a small portion of the subsidy. Though the banks are required to communicate the interest subsidy scheme individually to all the student borrowers, they do not inform the students. No publicity campaign has been done by IBA or by any banks. Probably IBA has misled the Government with wrong information. From the feedback received by ELTF, we are of the opinion that the Finance Minister has not been given the right picture of the management of the scheme. Though the students are promised 100% subsidy during the moratorium period, they are given only a small portion. Though one year holiday period is given after the study, many students do not get proper employment. Banks like State Bank of India after 3 or 4 months of moratorium period, treat the loans as NPA and handover to Lok Adalat and force students to sign documents to pay the entire loan within six months. While IBA guidelines permit flexible repayment schedule upto 10 to 15 years, the many banks, including State Bank of India, pressurise the students to pay money beyond their capacity, thereby defeating the very purpose of the scheme. This affects their credit rating through CIBIL. Recently, ELTF came across a case where a Branch in Chennai Zone of Corporation Bank did not submit the claim for interest subsidy, within the due date, since the officer was on leave. The insensitivity of the Branch Manager and the Zonal Manager has denied interest subsidy to an eligible borrower. This has also been brought to the knowledge of Finance Minister. ELTF is once again taking up the matter with Hon'ble Finance Minister through Shri S R Vijayakumar. ELTF appeals to the Government to constitute a committee of independent experts to look into the management of education loan and interest subsidy scheme.